Oakland County Executive L. Brooks Patterson may have a lot of bad things to say about Detroit, but the fiery Republican may want to focus on his own problems. A Motor City Muckraker review of public records has found a highly questionable relationship between the sixth-term executive and a long-time friend, Peter E. Meagher III, whose Farmington Hills firm receives county contracts while simultaneously helping Patterson pump millions of dollars into his campaign war chest. What’s more, Meagher is the treasurer for a nonprofit, Boost Oakland Business, which Patterson operates to collect hundreds of thousands of dollars in secret donations from corporations and special interest groups, tax records show. The group spends about $140,000 a year but is not required to disclose details. The 501(c)(4) organization is the same type of controversial tax-exempt group that landed Detroit Mayor Kwame Kilpatrick in prison for misspending money in his Kilpatrick Civic Organization. 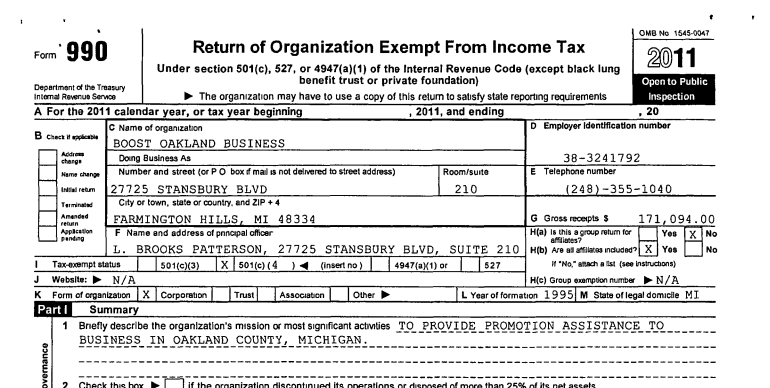 Although federal law generally limits the tax-exempt organizations to promoting “social welfare,” Patterson’s campaign committee, political action committee and nonprofit share the same consultants and Farmington Hills address – 27725 Stansbury Blvd., where Meagher is the managing director and a partner at UHY Advisors, a group of financial experts. Those consultants also benefit from county contracts, including ones that pay UHY employees up to $375 an hour for financial services, county records show. UHY Advisors also was hired to handle the suburban dispute with Detroit over the water system. Campaign finance records show that the nonprofit’s secretary, Kelly Sleva, received a $3,000 “gift” from Patterson’s campaign chest in 2012. Sleva also happens to be the county executive’s assistant. Patterson came under fire this week following a New Yorker article in which the executive said he has nothing good to say about Detroit. Public records also show that Meagher is also the Patterson campaign committee treasurer — and has been for some years. One document shows that Meagher is the Patterson campaign committee treasurer in 1992, meaning he has been in that role since Patterson’s initial election as Oakland County Executive. Is it true that L’s former driver is now a vegetable? Since their mysterious car accident, we haven’t seen so much as an archival photo of James Cram. For all of L’s recent bluster, it seems that the inconvenient matter of his hired help sacrificing life and limb to his boss doesn’t play very well to his reputation. Good hunting but are we shocked by all of this? They are all crooks and if you are not in their country club or fraternity, well then you will get squeezed out. I’m sorry. Where is the “crime”, or any evidence of “crime” here? By the way, Sam, the old canard “they are all crooks” is the last refuge of the stupid and lazy, so please give us a break. Isn’t this some Kwame Kilpatrick jail time stuff? (?) After announcing Patterson’s “problems” and mentioning the completely ignored 501(c)(4) “social welfare” limitation, this reads like a typical story of everyday government operation. Is there actually an allegation or evidence of corruption here, Steve, or are you merely projecting due to your irritation with Brooks’s pugnacious attitude/aggravation that Oakland County is actually competently managed? Since I brought it up- not attempting to come to Brooks’s rescue. However, worth mentioning that the latest drama resulted from words spoken by a 75yr old white guy that is a zealous advocate for his county. What else would you expect to hear from Brooks Patterson from Oakland County? Once again good job of investigating.